The buzz on Twitter about ‘The Socially Conscious Geek‘, the Core Conversation Lauren Bacon and I facilitated last weekend at the South by Southwest Interactive Festival (aka SXSWi). Here is a straight cut/paste of the tweetstream on each of the hashtags for our session — the official hashtag #sociallyconsciousgeek, which we shortened to the more manageable #scgeek. 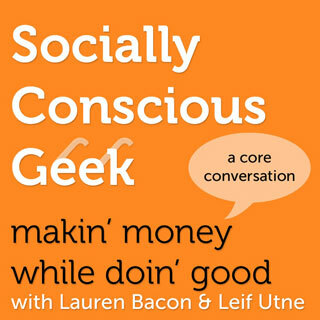 Are you a socially-conscious geek? Have you ever taken a job you didn’t like because you needed the money? Do you feel like you have to choose between your ideals and your wallet? Or have you figured out a way to make a decent living while making a difference in the world? What are some of your stories of success…or failure? Do you have any tips or tricks to share? Come join the conversation this weekend at SXSW! Can you make a living as a geek without sacrificing your ideals? Definitely. These pros have carved out a niche working with mission-driven, ethical clients in both the non-profit and for-profit sectors – and want to show you how to bring your values to work while keeping a roof over your head. If you’re going to SXSW, add us to your festival calendar, and come join the discussion Saturday afternoon. This little experiment in crowd-sourced fundraising worked! At 9:25AM US Pacific time, we beat our goal of raising $10,000 to help WiserEarth complete development of their API. All told, since April 22, just over five weeks ago, 102 donors contributed $10,319 to make this project a reality. This is a powerful, heartening example of the community coming together to benefit the whole of humanity. Thank you to everyone who helped make this happen: to the hundreds who helped spread the word across the social web; to the 28 tech leaders who lent their names to the OpenWiser appeal; to the folks at CivicActions and ONE/Northwest whose matching grants helped build early momentum around this campaign; and most of all the 102 donors who in these tough economic times contributed generously to a project that will truly benefit us all. The ChipIn donation tool for the OpenWiser campaign is now closed. But you can still support WiserEarth financially. Much of the work on the WiserEarth API is already done. In fact, a beta version of the API is now available for WiserEarth Organization records. If you would like to get your hands dirty now, you can join the WiserEarth API Developers Group and help with the beta testing and documentation of the API. Finally, if you are planning to use the WiserEarth API yourself, or just have a creative idea for how it could be applied, we’d love to hear about it. Are you thinking of building a mobile app, a browser plugin, a web widget or tool that lets users browse and display WiserEarth data in new ways? Or perhaps a mashup that mixes WiserEarth data with maps or tweets or some other datasets that support new social change initiatives? Share your ideas in the WiserEarth API Developers Group. This is a follow-up to his previous film, the hauntingly beautiful “Scared Sacred,” which chronicled the Canadian auteur’s 7-year journey, visiting sites of deep human tragedy — Bhopal, Hiroshima, Kabul, NYC after 9/11, the West Bank, and others — to find and document examples of extraordinary beauty and resilience. This is a powerful video. It nearly brought tears of hope to my eyes.